Hello! I have been putting together a little goodie basket for my daughter's teacher's birthday. 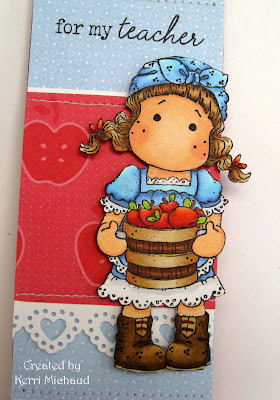 I had so much fun making my Your Next Stamp Space Boy bookmark, that I decided to make another one:) This time I used what is now my most favorite Tilda ever~Apple Tilda from Magnolia. Isn't she precious!?!? My husband has been off the last couple of days, so today we decided to take my youngest to the zoo while his brother and sister were at school. It was so fun to hang out just the three of us (of course we can't tell my daughter what we did LOL)! Thank you so much for stopping by and have a great night! Oh wow Kerri!! This is incredibly SWEET!! I love it!! The colors and everything are awesome!! CUTE image! Kerri this is simply adorable, beautiful coloring. SHe will love it. This is sooooo cute and ADORABLE!! Oh my goodness she will LOVE this!!! Your coloring is beautiful Kerri. Awww...love this Tilda! Super cute! Kerri, Your bookmarks are awesome. Your coloring on them is just perfect. I think making them for Christmas gifts is a wonderful idea. Thanks for sharing your talents. Have a good weekend. This is fabulous!! Your coloring is so perfect - the blush in her cheeks is just the right color! This bookmark is so sweet! Your daughter's teacher will love it! 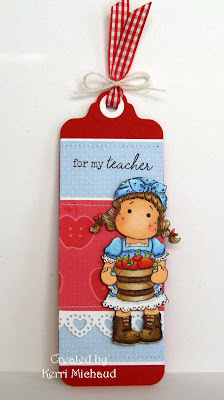 So adorable, your daughter teacher is going to LOVE IT!!! Love your amazing coloring! !